Actually I've written these for very selfish reasons . - I wanted to force myself to dig deeper and learn stuff. Hi Guys, Total Noob at this and Ive just bought the stingray 500 which I've already managed to bust the landing gear (thankfully just that), bought the batbone kit and a fortis Titan. Here I was thinking that cuz I can fly my nano qx pretty well that all the rest would be cake. bahaha..yeah..No. Got a new landing gear on the way for the stingray. For my batbone tricopter I bought a set of DT750 motors, 9X4.7 SF props Turnigy Multistar 45amp ESC's and the newer KK board. I need advice..this whole relationship between prop sizes, motors and batteries is driving me nuts. Im sure eventually itll all make sense. I just need somebody to tell me if the stuff I purchased for my batbone will work or have I just flushed money down the toilet. As you can see I get a little over enthusiastic with my purchases. Now to just find a place to Hide all this from my wife!!! Thanks in advance guys. I'm sorry if I'm asking stuff that has already been answered its just that Ive read the posts but im still a bit thick headed. Hydecyde, I think your 45A ESCs are overkill but I think the hardware can fly on a 3S battery (you didnt mention battery and that is key here too). The 750s are commonly used but are a large motor for this frame and will present more of a challenge to build. Smaller motors (like the 1450kv Suppos from AH) run shorter rotors, don't lift as much but are quicker to respond and tend to produce less vibration and require less balancing and tuning to get to fly well. I would recommend you start a thread for your build so we can give you more personal attention. Be sure to post pics and video (we like pics and video here). Welcome to FliteTest Hydecyde. I am looking forward to seeing your builds. Wow. Now why didn't I find this a month ago? Excellent job Balu, the content is concise and of high quality, as well as MR noob friendly. Thank you very much! Welcome Hydecyde, gee you really got excited with that purchase button didn't you!?! Cranial is on the money with what he said. Put the Stingray and titan to one side for the moment and work on the Bat Bone. Those DT750's are no use to you right now either and those multistar 45amp ESC's are unfortunately both too large to be of use with these multirotors and are also a pretty crappy esc. Go with altitude hobbies motor suggestion and get a KK2.1.5 flight controller. Hobbyking is restocking right now so avilability is low right now. You will need to change the firmware on the KK board so you will need a USBasp tool which can be bought cheap from eBay. Have a look in the Multirotor top tips section for a video on flashing a KK2 to get an idea what I'm talking about. For ESC's get three Afro 20amp. They work well and already have the proper SimonK firmware flashed on them which saves you having to fiddle with an esc yourself. You will also need some 14gauge and 16gauge red and black silicone wire from hobbyking as well as some male to male servo wires to connect your receiver to you KK2 flight controller. For the servo, just get the one flitetest recommends for now. Not sure on the props needed for those motors but start a thread with the gear you intend to use and wait for suggestions. I think they will probably use 8x4.5. CheapPlastic gemFans from hobbyking will work fine. When you work out what size buy lots as you will break them a lot early on. You will need one color for the front props and another for the rear for orientation. The front props will need to be one clockwise and one anti clockwise and the rear will need to be clockwise. If you are in the US, Altitude has the KK2.1.5 and the ESCs, motors, wire, heatshrink and servos and most of it (the parts that are the real learning curve) is in a kit for the Bat Bone. I fly at 6,300 ft above sea level and these 1450kv motors with 8045 rotors and a 3S lipo make a nice copter. I have carried a Go Pro, done flips and rolls with these motors on these kits and like FGA mentions, Simon K is already there. I own two of these kits from Altitude. I have a Knuckle I quad and a Bat Bone. You can source parts for less, but this is simple, proven better tech than the FT store page recommends and the service is very good. The 750s are commonly used but are a large motor for this frame and will present more of a challenge to build. Smaller motors (lequipment 0kv Suppos from AH) run shorter rotors, don't lift as much but are quicker to respond and tend to produce less vibration and require less balancing and tuning to get to fly well. Thank you so much for all the tips guys. I did get the kk2.1.5 flight controllers. Been waiting on the rest of the stuff from hobbyking. Since im back from a long trip (which is why i must apologize for the late reply) ive built the frames. Just no escs or motors as yet. Im definitely gonna look into the equipment and site u recommended Cranial. I live in Dubai. So shipping takes forever. Half the time I pay more in shipping than the equipment is worth. C'est la vie. thanks again.. here's a quick pic of my titan with my fpv gear mounted. Been bored so had to do something. One last question guys..regarding the props do they all have to go the same way? As in all ccw or all cw? Since the yaw is controlled via the aft servo pitching the prop? I would like to add two thoughts. 1. The more your copter weighs and the higher you fly, the more you risk your insurance. 2. The more ridgid your rotors, the more risk you have to your fingers. Nylon rotors hurt and may cause you to run for a bandaid. CF rotors may cause you to have to run to the hospital. Nylon rotors can remove fingers but just are not as likely to. Ridgid rotors tend to balance better and be better for video but when learning how to fly, stick with nylon and graduate to CF or glass reinforced. They are cheaper and less likely to send you to the hospital with your finger in a plastic bag on ice. LOL, FGA! No. 2 bears repeating. I have band-aids handy and can deal with superficial wounds. Chopped off finger on ice and a hospital, not so much. I need to order a box of props to practice, practice, practice and accumulate some multirotor airtime. Given the good reviews of the glass-mix HQ props, I'm tempted to get a bunch of those. Plastic FC props may be cheaper, but it sounds like I will wear through them much faster. However, setting aside cost and purely from a safety perspective, plastic FC or glass-mix HQ props? I think they are both bad when spinning at high speed. There are no bad sides to the glass nylon HQ's. Go for them, you'll love 'em. Depends on why you're breaking props . . . if you're still regularly breaking props due to noob-thumbs, stick with nylon until you've got full control and feel for the craft. Carbon flies Ooooh so much better but it's not more durable, and at least twice the cost. Carbon will break in an instant it hits anything hard, like asphalt/concrete or tree limbs. I've flown through bushes that nylon props chewed through without damage and carbon cracked on contact . . . I've also had inverted landings on grass that would eat 4 nylon props and the carbons kept it together. For durability I'd call it a wash. If you're breaking props because you're pushing to the hairy edge of performance . . . why aren't you flying carbon yet?!? This is why I love sticky threads - all sorts of great information in one place, links to more reading. Diligently mastering flight on my first quad - a nano qx - so I can start building one! What do you think, should I move this into the newbie section? Thank you for this thread, complete newb hear and trying to absorb this!! One thing that feels daunting when you're getting started is how to pick the right props, motors, ESCs, and batteries. I think the best way to choose your gear is to start with the props and work your way back to the battery. 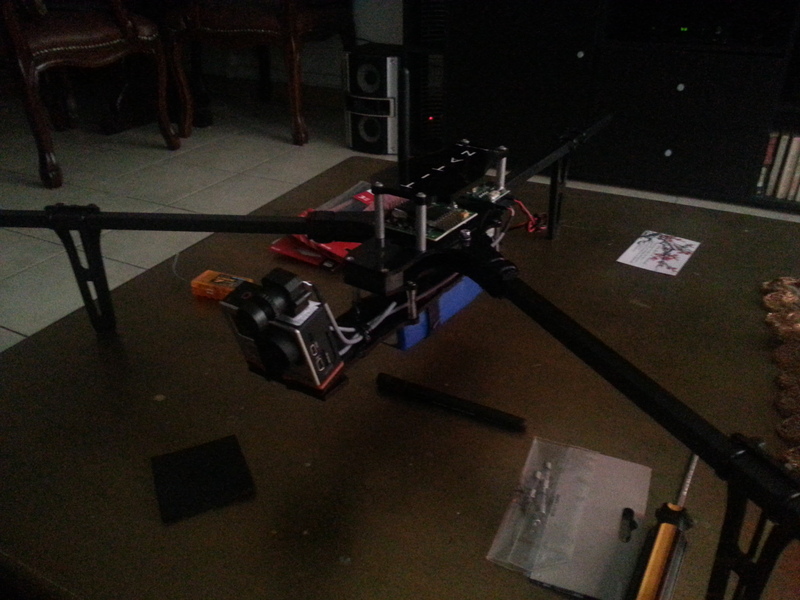 For example, if you know you want to run 6 inch props, choose a motor that will swing them. Then you should know how much current that motor will draw with that prop, so you can get an appropriate ESC and a battery capable of supplying your ESCs. Of course, if you're considering 3S vs. 4S, you need to keep that in mind from the start. Wow - that was awesome! I just had my first maiden flight with a Dragonfly with a Naze32 and the kit motors and escs (have to go look them up). My copter wanted to lift more on the left... any thoughts about that? I had calibrated the escs (I thought) by plugging the Naze in with my throttle at 100% and then bringing it down. My escs beeped and I thought that was it. When I tried to go up again in Angle mode - the whole thing started going higher on the left and then spun clockwise.